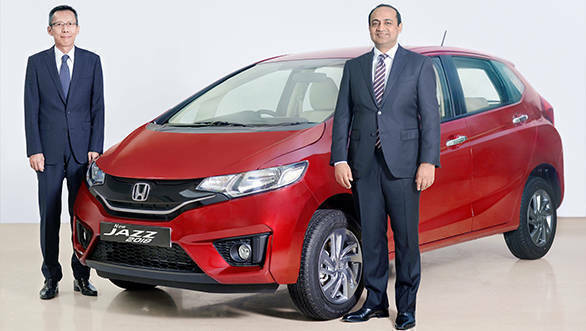 Honda Cars India Ltd (HCIL) has launched the 2018 Honda Jazz premium hatchback in India at a price of Rs 7.35 lakh (ex-showroom, Delhi) for the base V petrol variant, only Rs 4,000 higher than the outgoing model. The earlier lower-priced base petrol variants are conspicuous by their absence. However, there is a base S diesel variant, priced at Rs 8.05 lakh (ex-showroom). The new Honda Jazz receives minor styling changes as well as some tech updates for 2018. Among the biggest additions to the interiors is the 17.7cm touchscreen infotainment system with Apple CarPlay and Android Auto integration. The infotainment system also supports Digipad 2.0, has inbuilt navigation and acts as a rear camera display. The new Jazz now sports an engine start/stop button, as well as the Honda Smart Key System with a keyless remote. Beige interiors are now standard, as is a front centre armrest. For improved safety, Honda has included a speed-sensing auto door lock on the 2018 Jazz. Honda has done away with the two base E and S trims on the petrol variant of the Jazz, raising the minimum price tag by Rs 1.46 lakh over its predecessor. The 2018 Honda Jazz is available in three two petrol (V, VX) and three diesel (S, V, VX) trims. As earlier, the 90PS 1,199cc i-Vtec petrol engine has the option of a 5-speed manual or 6-speed CVT gearbox o the new Jazz. The diesel variant comes powered by the 100PS 1,498cc i-Dtec engine mated to a 6-speed manual gearbox. Honda also offers cruise control on the petrol CVT and diesel variants. On the outside, minor changes include chrome door handles and a new LED wing light above the rear windscreen. Honda has also introduced two new paint options, Radiant Red Metallic, and Lunar Silver Metallic with the new Jazz, in addition to existing options such as Modern Steel Metallic, Golden Brown Metallic, and White Orchid Pearl. Bookings for the 2018 Honda Jazz are now open and deliveries will begin soon.